Forget points. Forget shopping-list tasting notes. Forget wine tasting as a ‘competition’ to see which wine is best. The endorsement I will give this wine is that I love it. Each vintage I have tried has had the same personality. It’s the personality of a particular grape variety grown in particular soils. It’s bloody, ferrous, meaty and fresh, with minerality and bright fruit. It’s drinkable. It’s food friendly. And I like to drink it. Best of all, it’s affordable, at under £10. If I had this on the table with Lafite 2005, I would drink this first (if my experience of Lafite 2005 last year was typical – a tightly bound wine with roast coffee oak notes that wasn’t all that much fun to drink at the moment). The wine? Domaine Du Cros Marcillac Lo Sang del Pais 2009. 12.5% alcohol. This exactly what wine should be about, and also describes ‘serious’ young Bordeaux very well. I want to add to your main site article on science/wine – on closures. I think what is often forgotten about the Australian experiance is the pressure winemakers came under from UK supermarkets (especially 2) to move from cork into synthetic. The whole synthetic industry here was driven by the UK supermarkets, and Australian drinkers were not enthusiastic about them at all. It was possible ‘branded’ wine here with cork but in the UK it would synthetic. Duting this period (1999-’03) I was involved in developing a plastic plug and we felt it important to employ a full time staffer in the UK to deal with the bulk bottling halls and the buyers. I know winemakers here felt the pressure applied onto the new world to move into synthetic was not being applied to the old and because of the almost total reliance on the UK market for exports had no option but to change. Many winemakers believed that although synthetics made life easier for the shops, it was a detrimental mave for wine quality. The move into screwcap was different and was taken up by consumers and winemakers here with gusto. Forgive my frivolity, but this is one of the loveliest labels I’ve seen in a while. Elegant, informative, honest. I’m off to Terroirs tomorrow so I hope they list it. Well said, Jamie. A timely reminder that wine is primarily intended to be drunk for pleasure rather than collected or invested in. Any 12.5% red with fruit, balance and personality gets my vote. I don’t think it is very fair to compare this wine to a Bordeaux First growth in any way. Unfair comparison as these wines are such differnt horses for courses! Im glad you like it though! I love this one too. Couldn’t agree more about it. 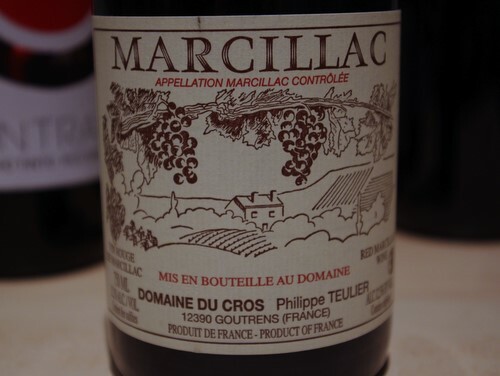 The Marcillac is great value though I do say so myself and is my house red. Ben – the UK landed cost of the wine (after duty, transport and handling) is over £5.50 so although we make our margin it is as it should be and no more. Doug – agreed – it looks like I stumbled across a real bargain then…I liked this wine at UK prices, and was gobsmacked to find it as cheap as I did – so cleared out the merchant’s stock. TWS sometimes sell it too. One of those wines I always seem to buy only one or two of, and wish I had more. If anyone visits the area (near Rodez in the Aveyron) do dine at Le Vieux Pont Belcastle. They list at least half a dozen Marcillacs and they’re virtually the house wines. Interestingly the Marcillac soil is same red ruffes as found in parts of the Terrasses du Larzac e.g. Octon. The day I read this I was delighted to find it on the list of one of my favourite South London eateries, The Canton Arms. A sturdy tipple. Goes well weith their heavily meat/offal/game orientated menu. Bought from The Wine Society on your recommendation. Excellent, versatile stuff. Sure to become a regular in the rack. The Phila PA state store in Garces restaurant sell this beauty for $13. Just found this webpage. I couldn’t agree more about the neglect of Marcillac wines. Supermarkets and restaurants in the Aveyron have it in abundance. Oddly enough the first bottle of Marcillac I ever tried was the very one in the picture. It was in a restaurant and was very competitively priced. It was so memorable that I went out to find somewhere to buy it. The same bottle in a local supermarket today would be about 7 Euros. There are many other wines in the south-west of France that are neglected in Britain. Madiran is another region making excellent wines at very affordable prices.